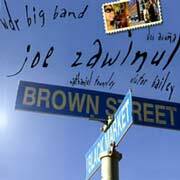 Brown Street, Zawinul’s live album with the WDR Big Band, will be released in the US tomorrow by Heads Up International. It was released in Europe last November and has gotten rave reviews from Zawinul fans who already have it, as well as earning a string of strong reviews from the critics. (See Stuart Nicholson’s review for the The Observer, and John Kelman’s review at All About Jazz.) I recently acquired my own copy, and it is as good as advertised. What’s cool about this double CD is that it presents Zawinul’s music in a form unlike any that has come before it: A big band that grooves like only Zawinul can. Eight of the eleven songs featured on Brown Street come from the Weather Report catalog. Though Weather Report compositions have crept into the Zawinul Syndicate’s repetoire in recent years–with one or maybe two tunes performed in a given show–Zawinul is not one to dwell on the past. The impetus in this case was a December 2001 performance by the WDR Big Band in Long Beach, California, under the direction of Vince Mendoza, when Zawinul received the first International Jazz Award at the International Association of Jazz Educators conference. (See “Zawinul Feted at IAJE Conference.”) A follow-up performance was part of Zawinul’s 70th Birthday Gala at the Leverkusener Jazz Festival in November 2002. Zawinul did not perform with the big band at either of these events–the keyboard duties were handled by Scott Kinsey–but they paved the way for Joe and the big band to team up for a brief tour in the fall of 2005, anchored by a week-long engagement at Joe Zawinul’s Birdland in Vienna. The music for the WDR/Zawinul recording came in three installments. The earliest came from music that Joe asked me to arrange in 1989 and orchestrate based on compositions from his solo recordings (“March of the Lost Children” [from 1990’s The Immigrants] and “Carnavalito”). The next installment of music was part of the tribute to Joe that I conducted with the WDR Big Band at the IAJE convention and also at the Leverkusen Jazztage, where we also recorded the Brecker brothers “Some Skunk Funk” recording not too long ago. “Fast City,” “Night Passage” and “In a Silent Way” came from that project, and I took much more license with the structure of the tunes, as well as freedom in the way that I thought the tunes would best be presented by a big band. You might notice somewhat of a different approach to these pieces. I put a little more of myself in those tunes, and took some license to orchestrate the way I thought the tunes could be “re-told.” The final installment consisted of a set of pieces that were arranged from various periods in the Weather Report output, including “Brown street” and “Black Market,” which were orchestrated in a much more traditional way. A lot of what I understood to be vital and fresh about jazz composition came from Joe and Wayne [Shorter]. Joe’s concept of ensemble writing is inherently big band friendly. I think he has deep roots in big band tutti writing, especially from Duke Ellington. However, I was always concerned with the ability to translate synthesizer lines to acoustic instruments, especially with melodies that are so specific to the original synthesizer timbres. Sometimes it doesn’t work. Synthesizers don’t blend in a similar manner to acoustic instruments. The best approach was to separate myself as much as I could from the aural memory of the original version and try to create a new palate. That is always the challenge with the use of electronics in acoustic music. And of course it always helped to go back to Duke. I tried to be sensitive to Joe’s suggestions and requests to, for example, make certain melodic ideas more prominent, or to use certain melodies that are the most important to the structure of the composition. Most of the big band music that I have written has been based on my own compositions. Over the years I sort of fell into the discipline of arranging other people’s music. Of course I cannot say enough about the influence Joe has had on my approach to writing Jazz. His music is vital, and is always about improvisation and groove. Years back I was asked to do some orchestrations for his first project with the WDR band. It was in fact my first encounter with the WDR band. I have been working with that band steadily and have a lot of wonderful memories, and of course great recordings. Zawinul gives Mendoza’s work high praise: “It’s almost a note-for-note adaptation, and it takes a lot of skill to score this music for a big band,” Zawinul says in the Heads Up press release. “Vince did an absolutely great job. He made it sound like Weather Report.” Indeed. This is an essential recording for Zawinul and Weather Report fans. By the way, Vince tells me he will be working with Joe and the Metropole Orchestra of the Netherlands in January 2008. It’s possible we may see a CD out of this project as well. This past weekend I had the privilege of hearing some of the mixes for the “20 Years of the Zawinul Syndicate” project. This is the project that I alluded to in an earlier news item, which will celebrate 20 years of the Zawinul Syndicate. It’s going to be killer. Three CDs of music culled from Syndicate concerts over the past 20 years. In fact, I think Joe and his son Ivan are going to have a hard time fitting everything they want to include onto three CDs. Living in the San Francisco Bay Area, I’ve been fortunate to hear the band many times over the years, and listening to these recordings was a trip down the Zawinul Syndicate memory lane. Among the gems are a handful of tunes from the Mike Baker-Gerald Veasley band of the early nineties. What a formidable band that was. Hearing some of the tunes–“Medicine Man” or “Victims of the Groove,” for instance–caused me to conjure up mental pictures of the band on stage at the Kuumbwa Jazz Center in Santa Cruz. Gerald Veasley had such great stage presence. He seemed to have such fun on the bandstand, and it was felt by the audience. And boy could he groove! One of the special treats that Ivan is working on is a sound montage containing various audio nuggets culled from Weather Report’s and Zawinul’s albums over the year. Long-time Zawinul fans will surely get a kick of out it. I believe this will segue into a grooving rap with Gerald Veasley that is very cool. I won’t say more as I don’t want to spoil it for you. There are also a number of duets between Zawinul and artists such as Bolot–the throat singer who performed on My People–and Arto Tuncboyaciyan. It was also interesting hearing Mark Ledford with the band. The trumpet player and multi-instumentalist, who passed away last year, did a couple of European tours with the band in the nineties, and I believe he is the only horn player that Zawinul has had since Weather Report. Ivan is intent on capturing the feel of a live Syndicate show. Dynamics are a key element of the band’s sound, which can go from a whisper to blasting out of the sound system, and Ivan wants to retain those dynamics on the CD. All in all, this is going to be a significant summation of the Zawinul Syndicate to date. And I can’t wait to get it. Welcome to the new Zawinul Online. I finally got around to giving the site its own domain, and in the process I spruced up the look a bit and added some new features. When I started Zawinul Online back in 1999, my idea was to create a catalog of all the Zawinul material I could find on the Internet. But that was in the days before Google image searches and YouTube video. Keeping those links up-to-date proved to be a never-ending process that I couldn’t keep up with, so I’ve pared back the new Zawinul Online to home-grown content. Of course, I’ll also continue to provide news and tour information as I receive it. We also have some new features. First, you can search the entire site. All of the news items from the old site have been migrated over, as well as specific articles and photo galleries that I created. Second, you can get an RSS feed. By subscribing to it, you can have the news delivered to you. And third, you can comment on news items. Feel free to give it a try when the urge strikes. Your comments won’t show up instantly, as I am moderating them to start. Also, if you do comment, don’t claim to be a public figure without providing me with a contact so that I can verify your identity. I don’t want people masquarading anonomously as someone else. Finally, if you link to Zawinul Online, please change your links to https://www.zawinulonline.org. If you notice any probems with the new site, you can email me at the address provided on the About page.